"A young man reluctantly joins a travelling family of evil vampires, when the girl he'd tried to seduce is part of that group." 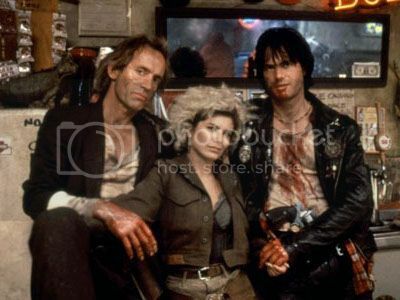 Since I won't be doing any more "Sci-fi Saturday" features until October is over, I've made up for it by rewatching Kathryn Bigelow's "Near Dark" - a film which reunites three of the cast members of "Aliens" (1986). With Lance Henriksen, Jenette Goldstein, and Bill Paxton starring in the movie which "The Lost Boys" (1987) could only dream to be, it couldn't fail, right? Unfortunately, although "Near Dark" achieved cult status later, it was a box office failure at the time. Apart from not being given enough promotion by the powers that were, I'm at a loss to explain why so many people preferred "The Lost Boys" over "Near Dark" even to this very day. Having been released within weeks of each other, "The Lost Boys" was essentially a teen comedy (which by rights should now have red letters on a white background for its DVD artwork) while "Near Dark" was hailed as a stylish and violent journey into the world of the undead. There's just no accounting for taste. At the time "Near Dark" came out, I'd never heard of Adrian Pasdar or Jenny Wright before, and to be fair, I don't think I ever saw them in anything afterwards either. One thing which I can't get my head around is whatever Jenny Wright did to upset people apart from being too pretty or for quitting the movie industry in 1997. I posted a big picture of her on my "Scream Queens" forum, and I had to remove it because it was getting so many downvotes. Why is Jenny Wright hated? If you have an answer, I would love to know. In "Near Dark", Jenny Wright is absolutely perfect as Mae. I freely admit to only buying "Near Dark" on VHS and (more recently) on DVD because I fancied her more than a fat kid loves cake. I have no explanation for my attraction to this cool and sensual beauty other than she looks so vulnerable yet so obviously isn't. Adrian Pasdar, however, isn't so hot as Caleb. Sometimes he looks slightly comical when trying to pull off an angry expression, and his inconsistent character is a little bit too "rapey" at the beginning. Some people might call him "pushy", but the scene where Caleb pulls the keys out of the truck and uses Mae's obvious distress to blackmail her into a kiss is beyond the actions of a typical horny teenager. If Mae had bled him dry at that point, I would have been much happier. In my opinion, Adrian Pasdar's role should have been confined to a vignette as I don't find any of the romance believable. The real star of the show is Bill Paxton as Severin who gets all the best and most memorable lines. Not to take anything away from Lance Henriksen or Jenette Goldstein, but Bill Paxton dominates the infamously shocking and very bloody bar scene. I could have done without the creepy, little boy vampire as played by Joshua Miller. He definitely does a good job, but he reminds me far too much of Asher Metchik who plays the titular character in "Milo" (1997) which I've also watched recently. I honestly thought that the two actors were the same person, and that Joshua Miller suffered from a similar genetic problem to that of the late Gary Coleman, until I looked up the cast list on the IMDb. I also remembered that Joshua Miller is just as creepy in "Teen Witch" (1989) although I haven't seen the recent remake of "The Wizard of Gore" to be able to tell you if he's still giving the same performance. Something which really stands out even more glaringly than the fact that the word "vampire" is never used anywhere in "Near Dark" is the fantastic soundtrack by Tangerine Dream. I bought the "Near Dark" OST CD when I saw it in WHSmith's bargain bin, but I sold it a few years ago on eBay for a nice profit. The music works in the film, but it wasn't quite so great for me on its own. One day, I might write a much fuller review of "Near Dark", but I've got wise to the weekends with nobody being online or bothering to read anything that I post. 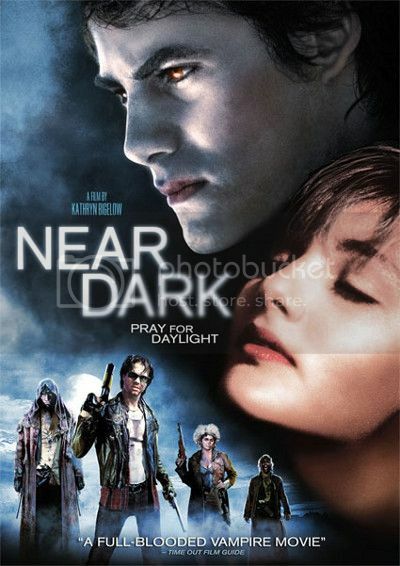 Suffice it to say that "Near Dark" is beautifully shot, exceptionally well directed (without even considering that it was Kathryn Bigelow's first time as a director), and is only very slightly underwritten. Like most vampire movies, "Near Dark" wasn't ever considered scary, but it was a great idea which deserved far more success. Conceptually, as a vampire love story, "Near Dark" paved the way for "Twilight", and we all know how popular that became, right kids? Bearing that in mind, you can hardly blame Lionsgate for the new DVD artwork.